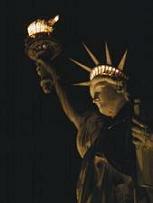 Liberty's Lamp: How's That Resignation Thing Going? To continue the thought provoked by Sarah Palin: Crazy Like A Fox, I'm observing that the local heat based on petty nonsense about Sarah Palin has died down and the national heat based on important issues has heated up, and in a good way. She has said that she will be much better situated to affect change outside of the governor's office. Within three weeks, she's nearly single handedly taken down Obamacare and broken a story about money going to Brazil to drill for oil. She's still taking a hit in the polls with most people who react inside the box regarding her resignation. But that will change when her book comes out and she hits the circuit. It did for Hillary Clinton. It will for Sarah. It was at this point in Reagan's situation following the 1976 loss to Gerald Ford that a poll was conducted that showed that more people would vote for Ford than Reagan if Ford decided to run in 1980. Reagan, however, still remained a top contender for the primaries as does Sarah Palin. Have you seen vicious comments and biased articles in the Anchorage Daily News as of late? Have the Alaska bloggers been chronicling and stalking every move of Sarah Palin as of late and spinning it in such a way that MSNBC can’t but help to buy into it? Have we read any stories lately about new ethics complaints being filed or complaints from state legislators because Sarah Palin may want to go speak at a dinner out of state? No. She’s not the governor anymore. Half the PR battle was won with her resignation. By taking herself out of the spotlight of the governor’s office and acting in the privacy that is afforded regular citizens without title, she literally pulled the plug on most of what the smear campaign was trying to do to her. It’s a brilliant move considering that she presents well researched pieces on her Facebook page which ultimately requires detractors to shift from personally attacking her to having to take her on about the issues. In this arena, the arena of ideas, Palin wins hands down. Her well documented dissection of Obamacare took down the “death panel” provisions in the House legislation. She has created a fire storm that has focused positive attention on the issue even if her detractors are still spewing hatred toward her. Instead of poking fun at her for being “Caribou Barbie,” liberals are now genuinely angered and anguished over the fact that their malcontent messiah is hitting a rough patch because of her. Suddenly the left is involved in an actual policy debate instead of silly clothing barbs because of her. She is a major threat to liberalism. The way liberals are becoming more and more unhinged shows they are being affecting by her presence. Her mere existence seems to cause them to reflexively expose their philosophy for the morally and intellectually bankrupt ideology that it really is. In conclusion, she is the lightening rod that is about to create a “death panel” for liberalism. UPDATE 01/06/10 - Congressman sees Palin in presidential race "'I thought she had made a career decision that would be hard to bounce back from,' (U.S. Rep. Steve) King said. 'It looks like she's bounced back from it and gone from there.'"